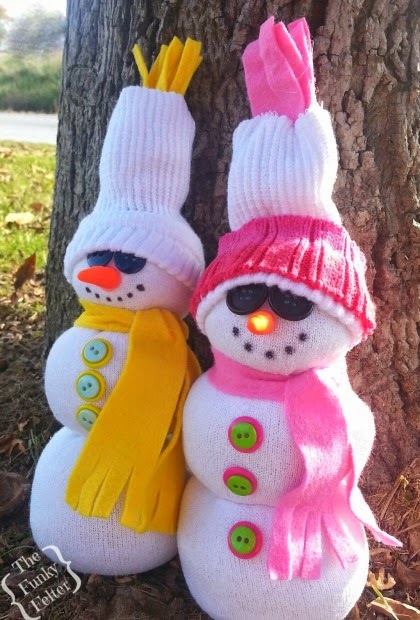 This past Saturday, there was another Craft Party Fellowship where we created these very easy-to-make tube sock snowmen. (You can read about our first church craft party here.) In the photo above are some of the little guys that we created. It was a fun afternoon spent stuffing socks and hot gluing, and chatting about kids, family and life in general. Below you'll find the basics of how to make your own. I highly recommend this craft for all ages and groups as it is both inexpensive and very easy! Felt or old cut up sweaters for the scarf, etc. Embellishments such as colorful buttons, Winter or Christmas decorations, etc. *Note: I made all the carrot noses out of polymer clay as seen in the photos. There will be a tutorial for that coming up next week so be sure to subscribe or follow my posts to get those free instructions when posted. In the mean time, you could draw a carrot nose on using an orange permanent marker or use an orange button, just to name a couple of ideas. 2. For the next two balls, repeat the same procedure, but use about a quarter cup of rice with polyfill. Form consecutively smaller sized balls fastening each off with a couple rubber bands. Leave the long remaining end of the sock alone - don't cut it, it is going to be the hat later. You can see in the photo below my sweet 5 year old kid helping the process along! 3. 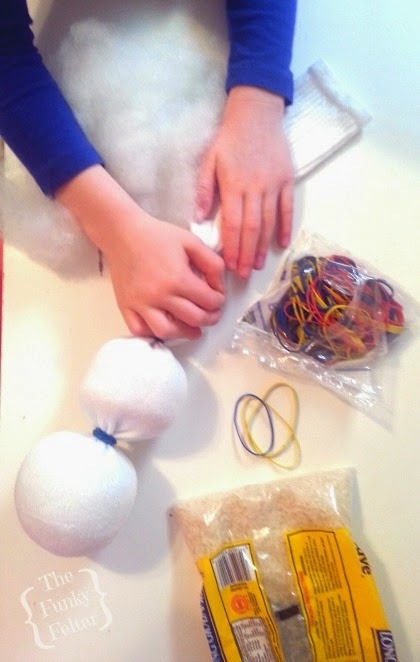 Using the hot glue gun, line a circle of glue between each formed ball and press (or squish) them together. Be careful not to get hot glue on the rubber bands as it can deteriorate them. Stick to putting the glue about a quarter inch out from the rubber bands. 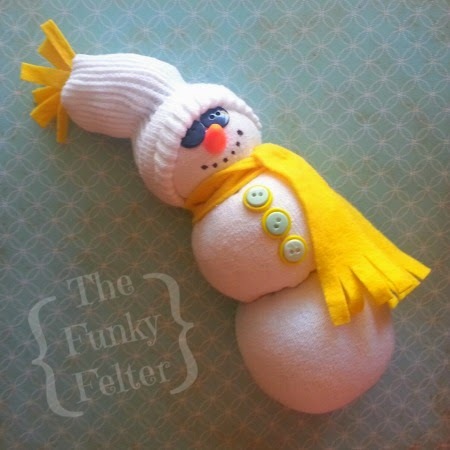 This will hide the rubber bands and give your snowman a better overall shape. 4. Now fold down the remaining long end of the sock to form the hat. Once you get it in a position you like, use a couple dots of hot glue under the side edges of the hat to hold it in place. 5. Hot glue a couple of dark buttons or wiggle eyes on for the snowman eyes. Use an orange permanent marker for the nose or orange buttons (or stay tuned for my polymer clay carrot nose tutorial coming up next week!). Use a black permanent marker to draw a curved line of dots for the mouth. 6. For the scarf, cut a foot long or so length of felt or sweater material and tie around the neck. Cut notches for the fringed ends if you like. For the top of the hat cut some thin slices of felt and glue inside the top edge or use a pompom instead. Finally, glue a few buttons on your snowman's chest or embellish with other Winter or Christmas decorations as you like. Just a note about storing these...since they contain a food product, I highly recommend you store these in some kind of air tight container to avoid rodents getting the munchies when they are on the shelf in your garage. A good plastic lidded bin would do the trick to keep your snowmen safe from harm! There are many, many tutorials for how to make these cute little guys online. I came across a bunch on Pinterest when researching these for the church craft party. You can make these however you like using a variety of fillers and sizes of socks so experiment and give each of yours their own personality. If you'd made these in the past, please share your tutorials and experience in the comments below! Happy crafting!